It is believed that the breed did not actually originate in Newfoundland. It seems almost certain that the Newfie did not originally inhabit Newfoundland. The island originally had a race of peaceful Indians with wolf-like dogs in the 15th century. They were used to hunt, fetch and carry. The white settlers who took over the land hunted down the dogs, leaving only the most obedient and useful. 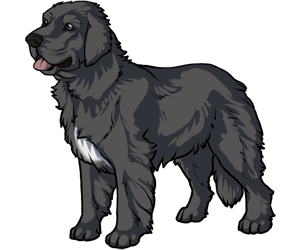 They were then bred with other dogs that were traded onto the island and eventually the Newfoundlands evolved from such matings. This added variety to the breed because hunting, water dogs and mastiffs were all bred into the original bloodline. This meant that different varieties of dogs were mated; these dogs included hunters, water dogs and mastiffs. The surviving puppies would have to fight for themselves, which created one of the strongest and most survivalist breeds around. In the 18th century, the breed was used to haul heavy loads and help fishermen in Europe. They were the poor man's dog. Over time, good quality pups were produced, resulting in the formation of the Newfoundland Club in 1886. - The Newfoundland is at home on land or in water and is a devoted companion, with natural life-saving instincts from water. - A Newfoundland named Hairyman, owned by Ann Harvey of Isle aux Morts, helped save 163 people from a shipwreck with the help of his owner, her father, and her brother in 1828. - Famous Newfie owners include; Explorer Meriwether Lewis, Robert F. Kennedy, Lord Byron, Emily Dickinson, Lyndon B. Johnson, Ulysses S. Grant, J.M. Barrie among others.